Turkish coffee (also known as kahve) is not just your average cup of joe. The tradition of Turkish coffee dates back to the 15th century when Yemeni traders first introduced it to the country. Nicknamed ‘black pearl’, it was revered not only for its flavour but the ceremonial aspect of its preparation and as a tool of social interaction. Centuries on, the culture continues to thrive and has been adapted by many (the Greeks, the Balkans, to name a few) while remaining at the core of a Turk’s identity. While no fancy espresso machine is required, this seemingly simple method of preparation commands serious attention to detail. First, dark roast Arabica coffee is hand-ground to a fine powder, some water (preferably cold) is added to a cezve (copper pot), then sugar is added – locals prefer it sade kahve (unsweetened), orta sekerli (a little sugar), tatli (sweet). If its flavoured with cardamom, cinnamon or anise, this is usually added during the grinding or brewing process. It's brewed slowly until just before the water boils and it’s set aside for the sediment to settle. After a few minutes, half the contents is poured out, with the other half boiled again until a thick crema is formed. 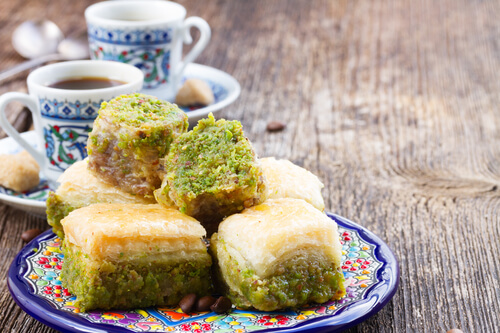 Here, the bubbly foam is distributed equally among guests and coffee is served in small espresso cups, along with some cold water as a palate cleanser, and a piece of Turkish delight or baklava. Once served, allow the coffee to cool for a few minutes which will allow the sediment to sink to the bottom before drinking. As the coffee is unfiltered, its texture tends to be gritty. To avoid swallowing a mouthful of it, gently agitate the cup regularly so the grounds are properly mixed with the water. If you must know what your future holds, have a go at the art of tasseography. Be sure to leave a small amount of coffee residue. When you’re ready, flip the cup over on the saucer, rotate it clockwise three times and leave it to dry. If the cup sticks to the saucer it’s said you’re in love (or someone is in love with you). If the grounds are distributed widely, it’s a sign you’re about to embark on a trip – which if you’re reading this, is proof there’s truth in the beans.